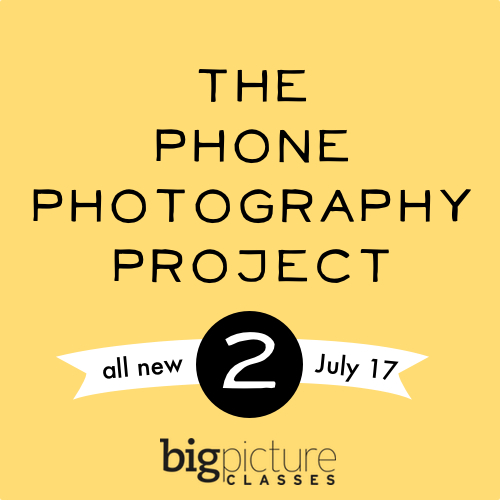 I am excited to share with you that I am part of this year’s teaching lineup in The Phone Photography Project 2 at Big Picture Classes, a follow-up class to last summer’s smashing success and original class. Starting this thursday on July 17th, the class features 28 days of amazing photo tips, app tutorials and all-around phone photography goodness. The collective talent of the 16 other teachers and 6 incredible guest teachers will blow you away and the supportive community will keep you returning to the classroom again and again. I can’t wait for you to get my lessons and see what we all have waiting for you in the classroom. If you’re interested in signing up, head over HERE now! I’m giving away a spot in the class to one lucky reader who comments on either this post below, or on my post from earlier today giving you TWO chances to win! You have until Wednesday to comment, and the winner will be announced on Thursday’s post . Good luck! I can’t wait to see you in class! ps. 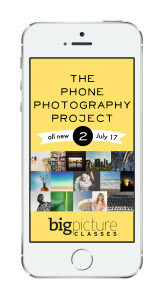 Didn’t get the chance to take the original Phone Photography Project? You still can! It is being offered as a self-paced “Summer Challenges” class through September 1st. You can sign up HERE. I’m so excited to see it offered I was sad to see registration had closed on the first one. Me! Me! Just left the iPhone world for Droid and could use some inspiration! How exciting! I want to win! that would be nice to win as I don’t use my iphone as much as I should. Oh, this is a fabulous giveaway!! what a great giveaway! I would love to do this course and learn more about my phone camera …….I would love to win!!!! I would love to win too. But there can only be ONE. 🙂 Good luck to all. Well of course it would be totally awesome to when a spot. Dying for a spot on this with Holly Clark. Have been hearing amazing things!! Fingers crossed. Me please, me! I need some fresh photography inspiration. This class looks awesome. It would be wonderful to win a spot for this class. Cause I take real crappy pictures with my iPhone. I could sure use some guidance in this area. Hand me my dslr no problem! make me take a picture with my iPhone ICK!!!!! Oh, how I would love to turn up my iPhone skillz! Hand up, teacher! Raising my hand, Me! Me! I would love to win! Would so love to win that spot! This is going to be such a great class. Would love to win this spot! Going on a family vacation in a few weeks and would love to learn how to take better photos on my iphone! I loved the first PPP and can’t wait for this one! Thanks for the chance to win a spot! I’ve been dithering about signing up for another course but winning it would certainly seal the deal! I love to win!!!! Hello to you all! This sounds very cool – I would love the chance at a place in the class! Thank you! Pick me! Pick me! So exciting! Holy moly, I’d love to win! Have so many gorgeous vistas where I live, but do a dismal job of capturing them on my iPhone. This is my passion so any additional training I could get I would love! Thank you for the chance to win.